Because it’s the last Friday before Christmas. And because I’ve fallen in love with the tree this year (because there’s no mess and no watering). And just because it’s pretty, here’s our 2017 Christmas tree once more. Merry Christmas to you and your loved ones. Enjoy your two Jacks Christmas. So pretty! Love your peace ornament. Merry Christmas Carole and may your heart be filled with joy. Beautiful tree! Merry Christmas Carole! I hope you have a wonderful Christmas with your family. Have a wonderful Christmas Eve and Christmas Day weekend! Enjoy every second of it. I also love your peace ornament. Happy (and peaceful) Christmas. Merry Christmas (don’t know where the ? came from). Beautiful tree! I love the peace sign ornament. 🙂 Merry Christmas! This is the first year we have a ‘fake’ tree. I made sure we got one that looks so real it is hard to know from a distance and I am loving it too! I was afraid after we ordered it online I would hate it and be sad I didn’t get a real one. However, I am loving it. Enjoy your special time with your family and your new grandson!!! Merry Christmas to you and Dale! A very Happy Christmas to you and your whole family, Carole! A very Merry Christmas to you and yours, Carole! Beautiful tree, and I love that peace ornament. 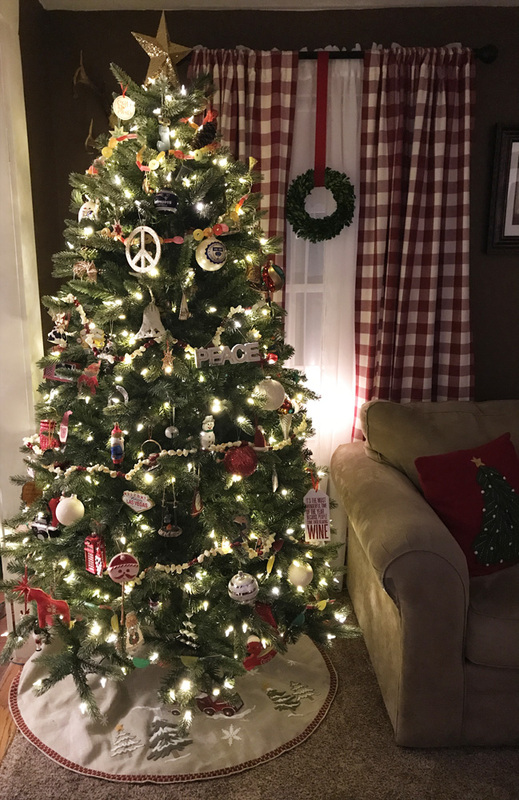 It’s beautiful, Carole (and I am 100% on board about how much I love my tree this year too!) – Merry Christmas!! Wishing you the merriest for your and your family.